Flora Mackie was twelve when she first crossed the Arctic Circle on her father's whaling ship. Now she is returning to the frozen seas as the head of her own exploration expedition. Jakob de Beyn was raised in Manhattan, but his yearning for new horizons leads him to the Arctic as part of a rival expedition. When he and Flora meet, all thoughts of science and exploration give way before a sudden, all-consuming love. The affair survives the growing tensions between the two groups, but then, after one more glorious summer on the Greenland coast, Jakob joins his leader on an extended trip into the interior, with devastating results. The stark beauty of the Arctic ocean, where pack ice can crush a ship like an eggshell, and the empty sweep of the tundra, alternately a snow-muffled wasteland and an unexpectedly gentle meadow, are vividly evoked. Against this backdrop Penney weaves an irresistible love story, a compelling look at the dark side of the golden age of exploration, and a mystery that Flora, returning one last time to the North Pole as an old woman, will finally lay to rest. 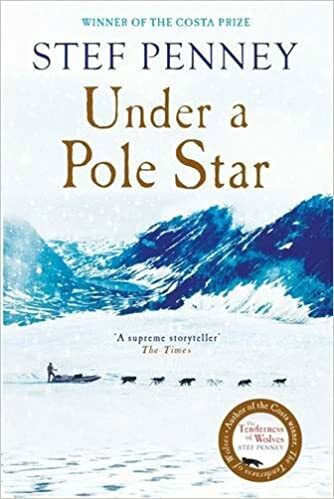 The start of Under a Pole Star by Stef Penney we are introduced to The Snow Queen, a now aging Arctic explorer, going to Greenland on another Arctic expedition in 1948. There is a reporter at the 1948 event. He is interested to know Flora’s take on some controversies about American expeditions that took place towards the end of the 19th century. The book then moves back in time to Flora Mackie in 1883 as a 13 year old on her first Arctic voyage on her father’s boat. This is before she becomes The Snow Queen in the press of the 19th century. With short periods spent at the 1948 event the book focuses in the main on the life of Flora Mackie and her explorations in the Arctic in the late part of the 19th century. The book also covers the stories of American expeditions at the same sort of time and particularly those involving Jakob de Beyn. It becomes increasingly obvious that there may have been something unusual about the American expeditions. I really loved the account of Flora as a teenager and the development of her life and interests. She is a strong and very well written character who will stay with me for some time. The accounts of the expeditions are detailed and extensive. Jakob is an important part of this narrative (as to some degree is Armitage, an American who led an expedition with Jakob and undertook another without him). I found Jakob a less vivid character than Flora though still interesting. In a sense this feels almost a biography of Flora – covering intimate and personal aspects of her life as well as the Arctic experiences. I really did find Flora’s life from 13 to her meeting with the reporter in 1948 enjoyable and I became happily immersed in it. The writing is of a very high standard. If I have any issues with this book it would be about the pace. The descriptive writing is great however, at times, it seemed to slow the book down for me. The inside story of those early expeditions is fascinating as the tale is gradually told. I would imagine this book would be a “must” for many Steff Penney fans.